What inspired you to give cycling a go? I was stood in the rain waiting for a bus that never showed up. I found that I was spending a lot of time doing that and figured I may as well just cycle in the rain, at least that way I would be getting somewhere. I was also going to a gym – paying money to stare at the same four walls when I could have been exercising and seeing the world at the same time. What do you enjoy about cycling to work? Most of all it is the consistency – give or take 5 minutes I know how long my journey will take me every time. I am also saving money. Using the Cycle To Work scheme spread the initial cost but now I am making some real savings. Exercise – I get a good amount of daily exercise and at weekends I can get out on local and national cycle routes either on my own or with friends and family. What would you say to other people thinking of giving cycling a go? The support is there if you need it. Check out UMBUG’s Cycle Buddies. They are people who live locally who will cycle along with you, share their experience and show you the shortcuts and quiet routes you may not know about. 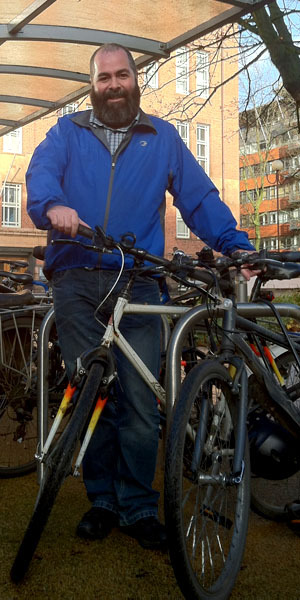 TfGM offer free cycle training for all levels of cyclists from beginners to more experienced riders. They also run basic maintenance courses so you have the knowledge and confidence to fix those occasional problems that crop up.